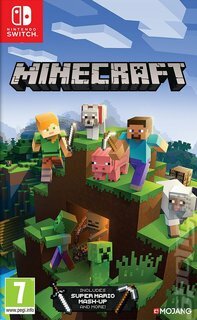 After setting a phenomenal trend on PC and making big waves across multiple consoles, Mojang s incredibly addictive world-creation game Minecraft has made the jump to physical media on the Switch! Create buildings, caverns, landmarks... you re only limited by your imagination. If you like, you can invite a bunch of friends along to help you build a masterpiece worthy of showing the entire world. But be quick about it, because at night monsters come out to play, so you need to make sure that you have made preparations for you (and your friends) to stay safe until dawn. This Switch version builds from the massive success of multiple versions of Minecraft. Right off the disc, players get bigger maps for bigger adventures. It also comes with expanded multiplayer features. You can get into the mix with up to four players on a split screen or up to eight players online. Especially for the Switch, Nintendo fans can dig into content that's very close to their hearts with the Super Mario Mash-Up content!